Welcome to Volume 2 of What I Wore Sunday, or as I'd like to call it here, "What the Whole Family Wore Sunday." Although I somehow managed to get all the children in rose or rose-toned outifts, it was purely accidental. Had we thought of it ahead of time, we would have all worn rose in honor of Gaudete Sunday. But alas, Phillip and I are uncoordinated louts. I wore a purple cowl-neck knit top with poofy sleeves (is there a technical term for that?) from the Sears outlet in LA and a grey Maurice's skirt with a jagged hem. And my Fergalicious ballet flats (still no close-up, apparently), which will make frequent appearance on Sundays as well as every other day of the week. I always feel that I am strangely Sergeant Pepper-esque in this top, even though that does not come across in the picture. Also, this photo was taken pre-make up, don't judge. Next is Phillip in a mint green fitted dress shirt and a tie from Banana Republic and brown slacks from Express. 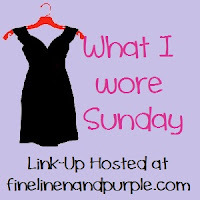 This is my first time linking up to the Fine Linen and Purple "What I Wore Sunday" dealio, though I have been wanting to participate since I found out about it a few weeks ago. So even though I am not exactly a paragon of fashion, I do enjoy dressing up on Sundays and putting effort into looking good for the Lord. However, this might have to be more of a "What my whole family wore on Sunday" because my daughters are my little dress up dolls and my husband cuts a fine figure in his Sunday best. Although, wait... a reconsideration.... there may be too much wrangling involved in taking pictures of the girls because they are squirmy and move a lot. And it may be especially hard to get a picture of Phillip since he pulls a Sasquatch whenever he sees the camera come out.